A Czech beer, Primator Weizenbier, has won the World’s Best Wheat Beer Award and Sharp’s Cornish Pilsner has been awarded World’s Best Lager. 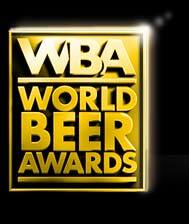 The World Beer Awards are the global awards selecting the very best internationally recognised beer styles. This annual tasting selects, awards and promotes the ‘World’s Best Beers’ to consumers and the trade throughout the world. Beers must be generally available and for sale in bottles or cans. Judging is blind with regional style heats held in Asia, Europe and the Americas. All regions have their own Chairman and group of judges who select the style winners in their region. Style winners from all regions are then tasted against each other to select the World’s Best Style. From these world winners the judges can then select the World’s Best categories, from which the World’s Best Beer is selected. Brewers, agents, importers, wholesalers and retailers for any beer or brewery anywhere in the world can enter the competition. The eight categories are based upon the common beer groupings and within each category the beers are grouped by ‘style’, rather than origin. Some styles are, by definition, regional or national. European chairman, Adrian Tierney-Jones, said: “It’s fabulous to see that the best lager has been won by Sharp’s for their scintillating Cornish Pilsner, proof that the lagers of the UK are no longer a laughing matter. “While we’re talking turn-ups for the book, it is also intriguing that the world’s best beer goes to Czech brewery Primator, for their Weissbier, a style that had died out in the country while continuing to thrive next door in Germany.